Provo • Offensive lineman Tristen Hoge carries around a notebook to keep track of his daily experiences on the BYU football team. Half of the Notre Dame transfer’s notes contain the blocking and pass protection instructions he receives during practices and team meetings. The other half includes one-liners, jokes, quips and other quirky sayings from 29-year-old assistant coach Ryan Pugh. Turns out BYU’s new offensive line coach is quite a crack-up, in addition to being a four-year letter winner at Auburn and the starting center on the Tigers’ 2011 BCS national championship team. The young coach said the offensive line he oversees will have its hands full Saturday when it faces one of the top defenses in the country, No. 6 Wisconsin, at Camp Randall Stadium in Madison. “They have a culture of outstanding line play there that we are trying to establish here,” he said. In between, there’s time for a few lighthearted moments. Pugh gets serious in games, on the practice field and in meetings, but also throws in “oddball, off-the-wall comments that are light-hearted and fun and help us understand what is going on,” BYU offensive lineman Thomas Shoaf said. “We are going to make a book of them,” Shoaf added, laughing. A native of Hoover, Ala., Pugh said he “grew up in a coach’s office” as the son of a football coach and knows what the players are going through, so he tries to find a good balance of hard work and laughter. After playing at Auburn, Pugh was a graduate assistant under new BYU offensive coordinator Jeff Grimes at Auburn, Virginia Tech and LSU and spent the last two years as the offensive line coach at UT San Antonio. “Most people who have seen me coaching on the field know I am an intense guy, but in the meeting room and off the field I like to have a good time. I like to keep it light because I always want to keep them learning,” he said. “The moment they stop learning, the moment I stop learning, and the moment I stop becoming a teacher and a motivator and I am just a yeller and a screamer, is when we stop getting things accomplished. Shortly after they moved to Provo, Pugh and his wife, Cathey Lee, welcomed their first child, a baby daughter named Etta Graceyn, into the world. They also bought a new home. Head coach Kalani Sitake said Pugh has been around Grimes so much — reaching back to their Auburn days — that they seemed like father and son. There is a good reason for that. Grimes said it was a no-brainer when he replaced Ty Detmer last December that he would strongly consider Pugh to replace Mike Empey even though Empey had done a satisfactory job with the BYU OL in 2016 and 2017, by most accounts. Pugh has played the same five offensive linemen — Shoaf, Hoge, freshmen Brady Christensen and James Empey and senior Austin Hoyt — in every down of both games to date because the “iron five” has earned it in practice, he said. “That doesn’t mean it will stay that way,” Pugh said. “We are challenging our guys each day to compete to be in the top five." • Four-year letter winner at Auburn, where he was the starting center on Tigers’ 2010-11 national championship team. • Was a graduate assistant at Auburn, Virginia Tech, Cincinnati and LSU before becoming UT San Antonio’s offensive line coach in 2016. 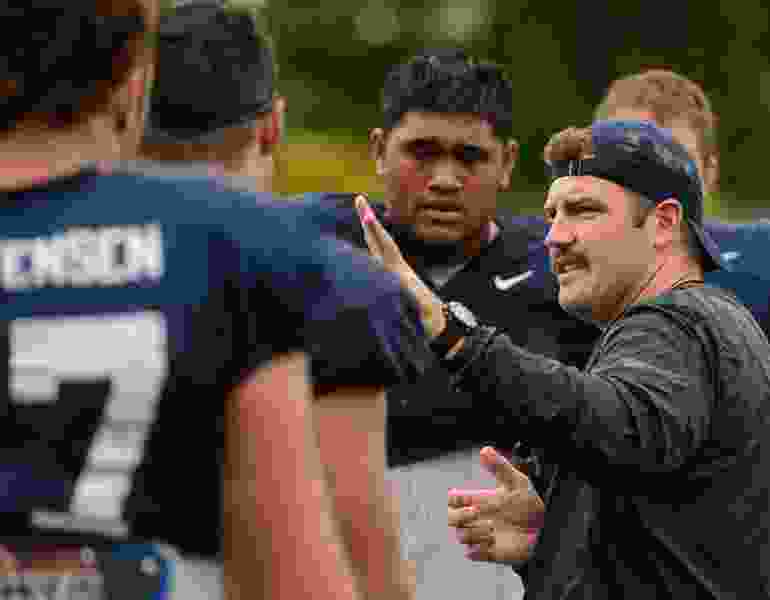 • His wife, Cathey Lee, gave birth to a baby daughter during BYU’s 2018 spring camp.